The name of Narmer occurs on other objects, generally scratched on potsherds and the like, and we can be sure that he was a historical personage. Hor-Aha, his successor, and therefore probably his son, possibly by Queen Nithotep, stood to inherit a unified kingdom, both by right and by conquest. He took the nebti name (the second royal name: p. 218) of Men, which means 'established', and this could be the origin of the later record of the first king as being called Menes. For present purposes we may look on Hor-Aha as the first king of the 1st Dynasty. An interesting piece of evidence is a small broken ivory label found in the tomb of Queen Nithotep at Naqada. 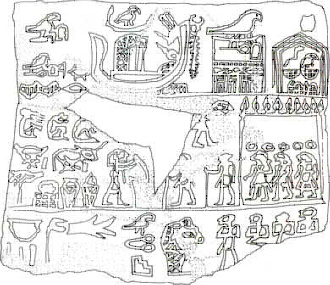 Although schematically represented, the busy scene on this tiny piece seems to show two humans celebrating a ceremony called 'Receiving the South and the North' over an unidentified object (possibly the first representation of the later symbolic tying of papyrus and lotus stalks). Ivory label from the tomb of Queen Nithotep at Naqada which has in the top line the Horus name of Hor-Aha (second from right) and his nebti name, Men, in front of it. British Museum. 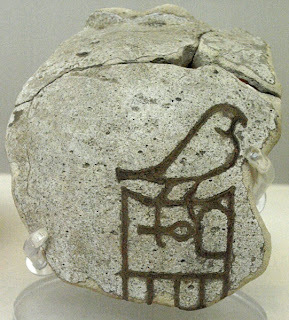 The king's name, meaning 'Fighting Hawk' - an allusion again to Horus - indicates his Upper Egyptian origin and rule. His adoption of Men as his nebti name for ruling over both parts is indicated on the ivory label by the fact that his Horus name (his first and principal name, p. 218) Hor-Aha, and his nebti name, Men, appear side by side. Other similar small labels from Early Dynastic tombs indicate that his was not an easy reign. There were campaigns to be fought and rebels to be subdued in Nubia, recorded on a wooden label from Abydos, and another label records his foundation of a temple to the goddess Neith at Sais in the Delta. Her warlike aspect was signified by a pair of crossed arrows and her worship continued into Roman times when she was identified with Athena at Sais.